Dear Minister of Health, How Do You Measure One Year? Teresa Pocock on October 9, 2014 at my art show, ‘The Real Poop on Social Change‘ in Victoria, B.C. I look at my sister Teresa and all the wonderful things she is doing with us now and I take a deep breath. I give thanks for where we are today. This past year has been an extraordinary and tumultuous year for Teresa — and for myself and my husband, Billiam James. 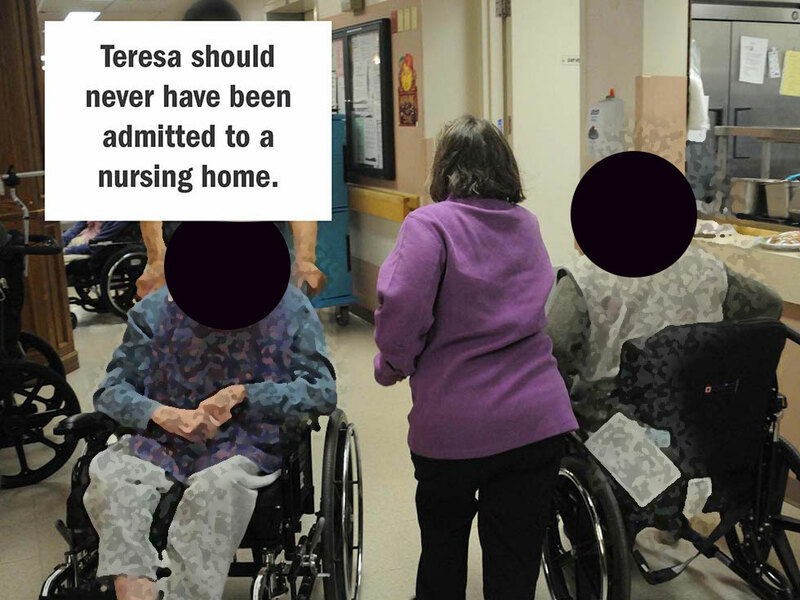 One year ago, my sister Teresa was forced into an Ontario nursing home, against her wishes, and against the wishes of my father. I was horrified to see Teresa in an old age home — surrounded by very elderly people, many of whom were severely incapacitated. She did not belong there. Teresa Pocock on November 30, 2013 at the Rekai Centre in Toronto, Ontario. One year ago, on November 30, 2013, my husband and I helped my father secure Teresa’s official release, and she came to live with us. 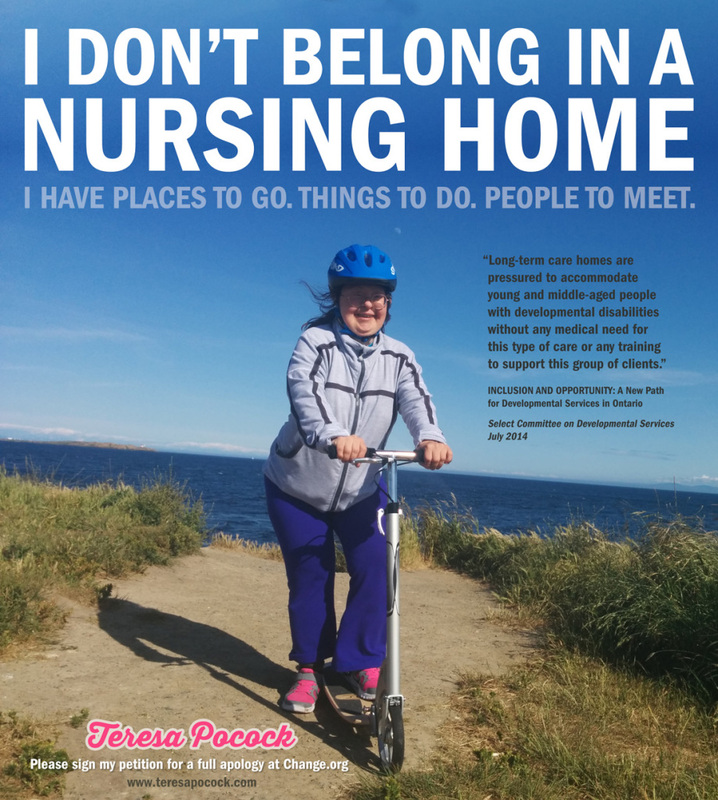 The truth is that if we had not rescued Teresa from the nursing home, she would have been living in an Ontario institution — with no right to choose otherwise — for the rest of her life. How big a problem is this in Ontario? How many developmentally disabled people are forced into nursing homes? CBC Radio did some digging and discovered that 5,338 developmentally disabled people under 65 were put in Ontario long term care homes between 2008-2012. Listen to The Current’s documentary: 21-year old Ontarian lives in a nursing home. But, here we are — one full year since Teresa’s discharge — and we still don’t have any accountability. In March 2014 we moved from Ontario to British Columbia to create a brighter future. It has been a very full year indeed — one of exploration and discovery. Free to explore new places! Teresa got her first passport in 2014! 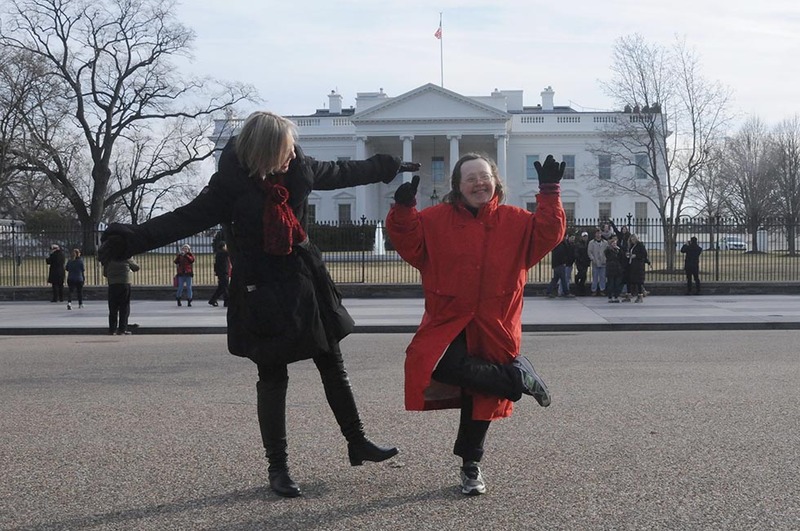 Teresa dancing in front of the White House in Washington, DC in February 2014. Free to cheer and shout! 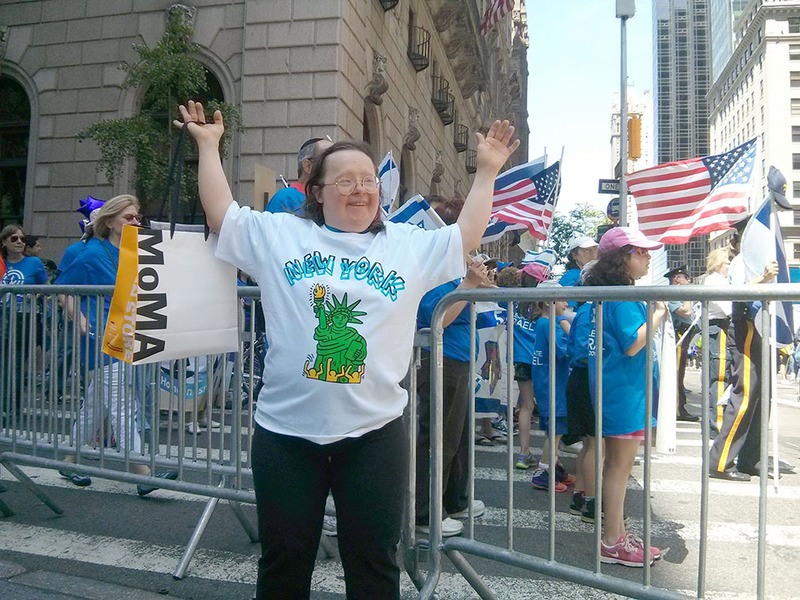 Teresa watches a street parade in New York City, in the Spring 2014. 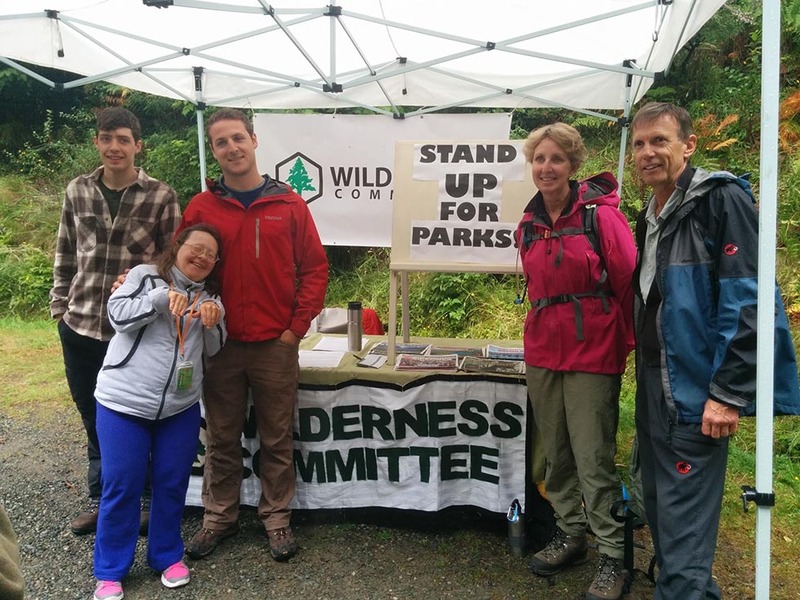 Teresa volunteers with the Wilderness Committee by cleaning up the shoreline and handing out posters. 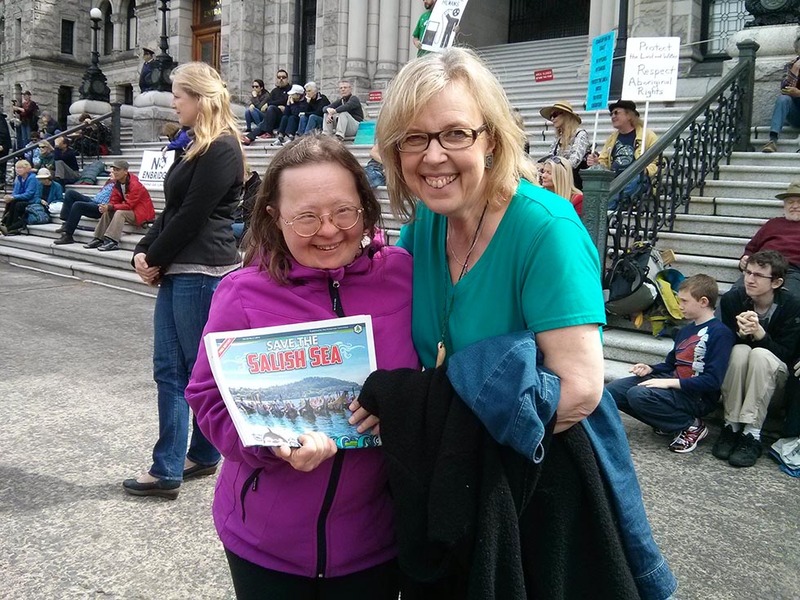 Teresa gave Elizabeth May, MP a copy of the Wilderness Committee’s paper “Save the Salish Sea”. Free to breathe fresh air! 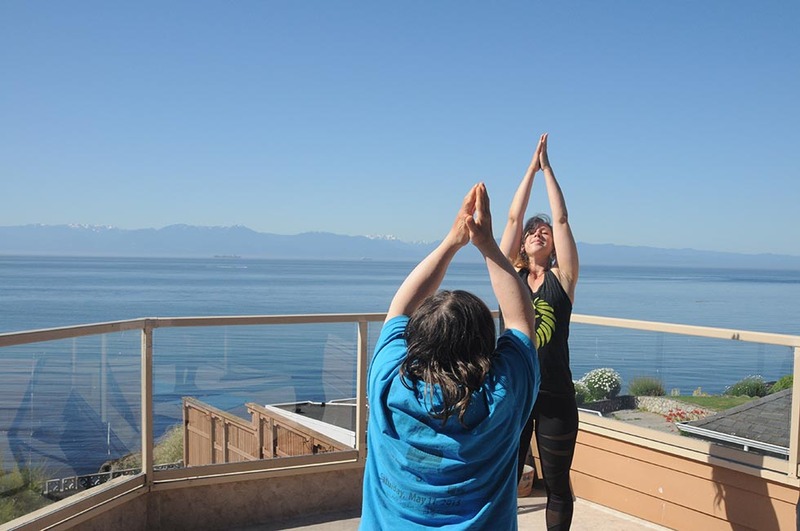 Teresa does yoga to build strength and flexibility. Teresa power walks uphill and down dale. Free to sing out loud! Teresa sings Girls Just Wanna have Fun! Free to celebrate Canada Day! 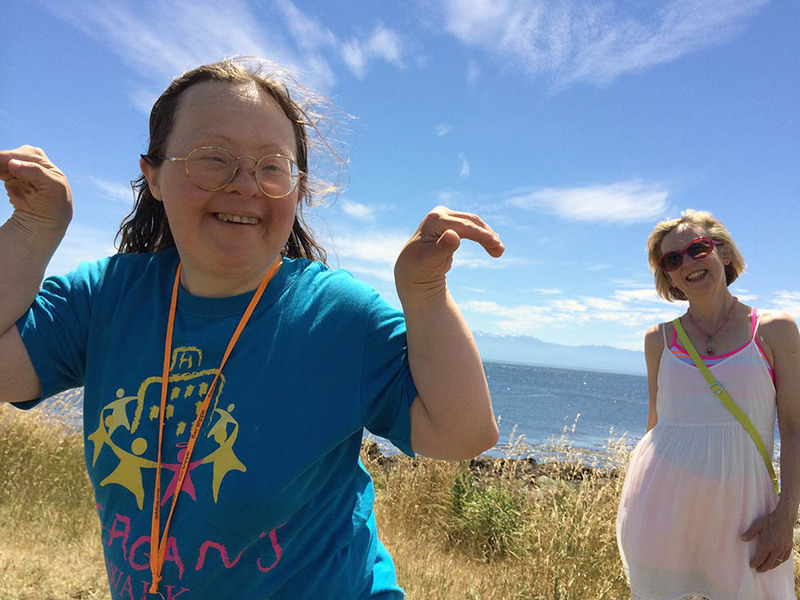 Teresa celebrated Canada Day on the seashore in Victoria, B.C. Free to stand up for peace! 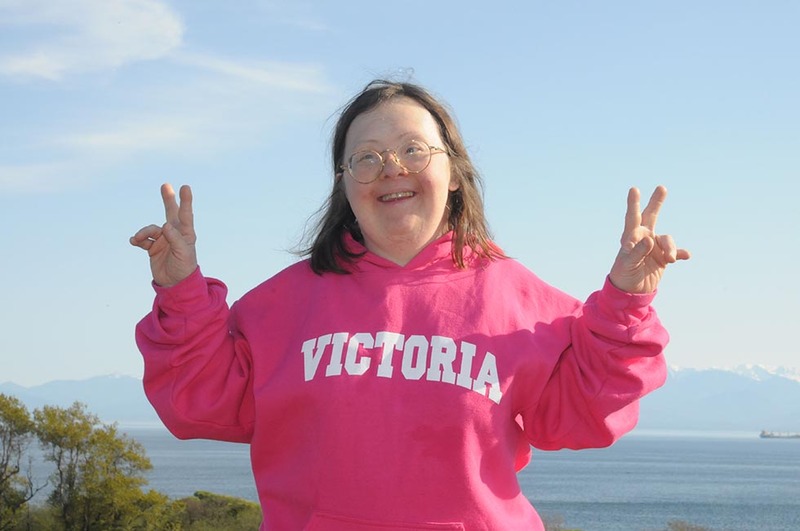 Teresa flashes her “V” for victory and peace. It is a victory that she is no longer in a nursing home! Free to make new friends! Teresa is very sociable and loves making new friends. 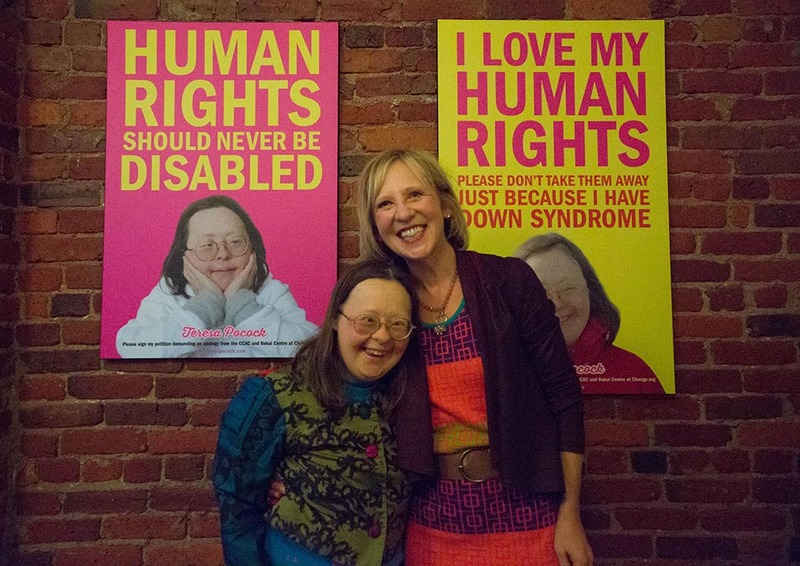 Teresa Pocock with me on October 9, 2014 at my art show, ‘The Real Poop on Social Change‘ in Victoria, B.C. Dear Minister of Health, Teresa would love to hear from you! 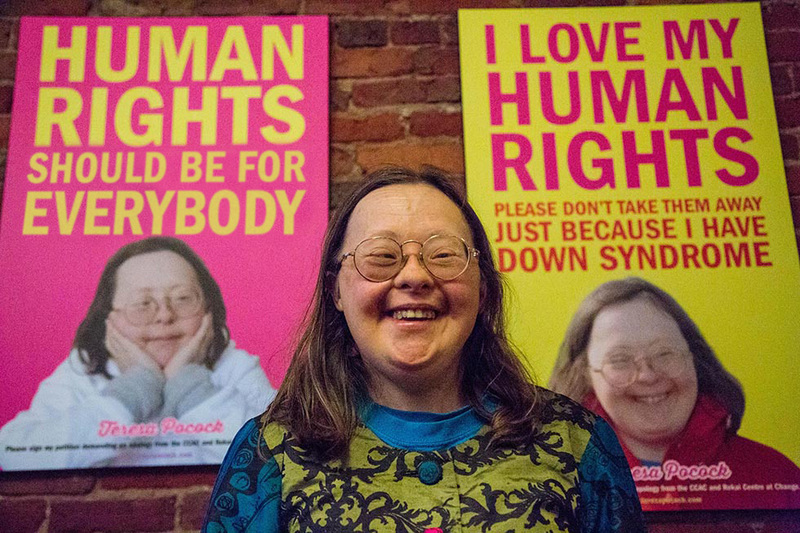 Human Rights Should Never Be Disabled. 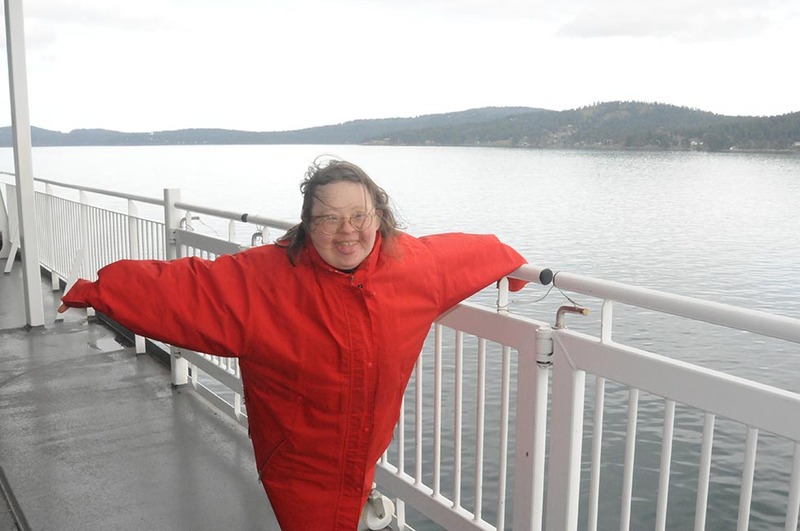 Forced into LongTerm Care at 49, my sister with Down syndrome wants apology. You have my full admiration, support and I’m almost out-of-body-happy to know you. I work with Down’s syndrome folks and others with intellectual challenges through Northumberland (Ontario) Respite Services. There appears to be a definite lack of housing for those able to function without the need for full time care. All of the people I work with are in their 40s and and have aging parents/caregivers and I am very concerned about where they will go when the parents can no longer assist them. Old age nursing homes are certainly not the answer! So glad you are speaking out about this issue! 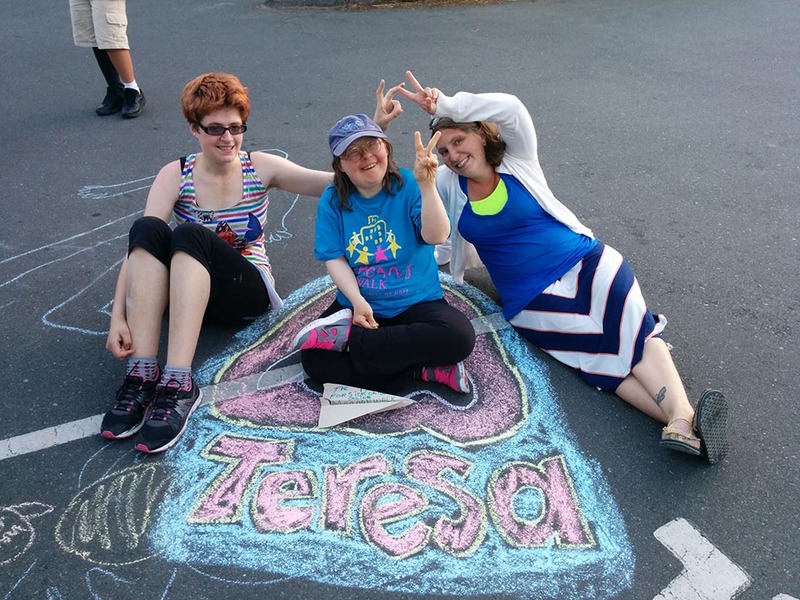 Teresa looks like she has much to contribute to her community and to British Columbia. Welcome to the West Coast! Brilliant. You didn’t just drive the point home, you hammered it home! A complete abandonment of human rights. All those thousands of people we know for sure don’t have such fine people as you and Billiam to speak out for them. This has to get known and broadcast. Thank You! The strength in this family is great the love endless The government across Canada not only in. Ontario but BC also need to wake up and take better care of all people with a disability. I work in this field and I’ve seen the devastating effect of budget cuts have had. Teresa deserves to have her basic human rights honoured and to live her life freely. I am HORRIFIED to see so many young people with intellectual disabilities in nursing homes! There has to be a better place for them. My little (foster) sister lives in a group home where she is encouraged and expected to be a unique individual, fully enjoying the world around her. She works, goes on several outings per week and has 4 roommates close to her own age who have similar interests. She LOVES being as independent as she is able to be. (She has severe CP that affects all 4 limbs & her speech.) She is encouraged to get out & be free! Everyone should have that ability! Government by the people and for the people (ALL) people is a slogan we should adopt from our southern neighbour’s historical declaration and… make sure to keep it that way now and for all time, for ALL citizens. The implication is that ANY government, worthy of that term should govern on behalf and for the good of ALL its citizenry. This is so true. I’m so glad you have pursued this and gave your sister the freedom she is entitled to and deserves. How can this be happening in Canada? Where is the accountability here from the Government? With all their childish bickering in the House of Commons, they cant even address this properly. Don’t let these things happen. Canada needs to care for ALL Canadians. Those who have challenges due to aging, illness or disabilities of any kind, need to be provided with ” suitable housing” showing consideration for their needs and respect for who they are. It is important to treat all people with respect and affirm their human dignity with our support and love. Another person is another me and if I hurt someone I am hurting myself and diminishing my human dignity too. adversely affected her life. Bless you, sister for giving her, her life back. What is wrong with our government, that they should place people inappropriately? Is it just a case of out of sight out of mind? My brother is 26 and has Down Syndrome, and I would be appalled if this ever happened to him. I would really like to see the Ontario government take measures to ensure that people with special needs are cared for – and not in nursing homes, as this is not an appropriate place for them! We can’t imagine anyone sending either of these “free spirits” off into a facility. Theresa is definitely owed an apology at the very least. This is a total nightmare. I’m so sorry you experienced this. This shouldn’t happen to anyone. Your happy, active pictures speak volumes to this story! Human rights should never be removed from anyone. Canada is a country that prides it self as defender of freedom and human rights and thus should not be able to curtail such rights to its citizens. Government answers to the people not the other way around. Human rights aught to be inalianable and not to the whims of goverments. Human rights are an inalianable right especially in Canada where the government promotes it with pride. Just saying feedom is here at a news conference isn’t enugh, you also must defend such statements and garantees. How wonderful to see the photos, proof she is living her life to the full now. How can we as a society put folks away and out of sight like this. Canada is supposed to be a free and welcoming country, we certainly let many immigrants in who are less deserving. How about our own people, shouldn’t they come first ??? Horrifying situation! Let’s make amends to all folks like Theresa. This is fantastic. I love it when a plan comes together especially when it comes to the smaller people in this world against bureaucracy and those that don’t want to care about other people. Congratulations on a job well done!!!! I remember sitting behind Teresa and your parents at Blessed Sacrament Church many years ago. I remember especially after your mother had a stroke and the love and care there always was for each other. I am so glad that you were able to arrange for Teresa to live with you and your husband. May God’s blessings and strength be with all of you! Having taught several Down Syndrome kids, it always makes me very sad to see how DS people are treated. On the bright side, I’m always delighted to see them employed in jobs with public exposure. Living in an assisted living seniors’ home? I don’t think so! Developmentally disabled persons do not belong in nursing homes. Their everyday needs are completely different from the elderly. They need their own home where they can continue to learn and be stimulated by both indoor and outdoor activities. That there is no such place for Teresa in Ontario is shameful! Every human being has the right to reach their full potential. I am happy that you got your freedom back, Teresa.You will also be helping out lots of other people with announcing your success via posters and email. This should not be allowed! 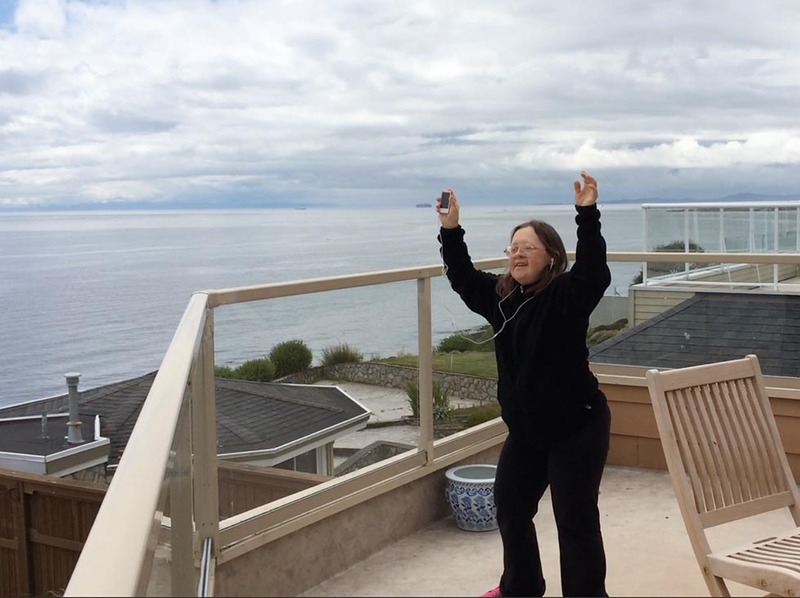 Long Term care is not for young people with Down’s syndrome! We ALL deserve a GOOD life. Why would you deny it to this woman?? I think what you are doing is incredible and awesome! I read and signed your petition some time ago, and was (and continue to be) deeply moved by your story. Teresa is SO lucky to have such a loving family, who are willing to help her go to such lengths to fight to change an obviously broken system. Stick to your guns, and don’t give up! Congrats Teresa. It is atppalling what was happening with children & young people. We have come full circle back to what was happening in the 1970’s & which we vigorously advocated against. Shame! I think that it is disgusting that the government feels that they have the right to take away anyone’s right to freedom. Disabled people like Theresa are not disabled. I am happy she is free and never should have been forced into a seniors facility. The government is going to destroy the human race at one point in this life. People who have done nothing wrong should never be forced into something because the government says so. I think everyone should fight for their rights to freedom and their way of living. Good for you Theresa and your family. This is a sad story with a happy ending for Theresa. However it is a n example of Bureaucracy gone wild, and it is time to ensure this never happens again, This is Robotic Governing. STOP IT TODAY ! Thank you for letting the rest of us know what is going on in Ontario and who knows where else. Has the government gone backwards? Have they not learnt from past mistakes? May your sister and others enjoy their freedom because of the work that she and you are doing together. Keep it up and I will continue to support you. This is wrong in more ways than I can even nightmare of. Ontario – please fix this NOW! It was wonderful to view the pictures of Teresa, living life as she should. She appears to be living a full and happy life with her loving family. Some seniors i know would probably be offended with these comments. Some nursing homes are awesome. Maybe would could focus our energy on making all seniors homes an great place for anyone to live. From the pictures, it looks like Theresa family has means to travel and live well. Lucky girl! I worry about persons with D.S. that do not have supportive family. In fact, I worry about all persons without supportive friends and family. I agree the system is broken, but let us not simply focus on what we don’t have, but more what we have to be thankful for in Canada. We have come a long way in the past 50 years for rights for disabled persons. We have to lower our expectations, and not expect everything to be “fair”. It’s still not equal for women, let alone disabled women. As a retired teacher with many years of working with ‘exceptional students’ I am aware of the potential they can have. To place them in a home with end-of-life elderly patients is so wrong. This denies them the opportunity of using and developing their potential and the ability to live a full, happy and fruitful life. I believe that, until our politicians and leaders have some experience and contact with our ‘special citizens, they will not understand their needs. Those needs are to be treated with respect, to be given the chance to give to society, to be challenged and protected and to enjoy all that there is out there that makes life wonderful. Not all of our ‘special’ people have strong advocates as Teresa has, so isn’t it the duty of our leaders and politicians to be their advocates? Congratulations for a job well done by the family and Teresa herself. It is an undertaking of enormous proportions to care for a person with special needs like Teresa and it is done out of love . Bravo. Don’t hold your breath. The Ontario ministers are notorious for ignoring the citizen’s voice. A corrupt government does not care about the fine print. You are lucky you have moved. I’m so happy for your freedom Teresa, it seems ‘The Powers To Be,” have forgotten, what we have learned from our past! HOW SHAMEFUL…. ML. Mom of a young child with Down syndrome. A Nursing Home is not the answer. If they stay at home with the necessary services provided – all would benefit. You have so eloquently shown us the problem and outlined a common sense solution. Thank you. Continue to ask questions of the bureaucracy as they do not have the answers. Let us know how we can continue to support you! It’s so wrong to essentially imprison a young-hearted and vital person like Teresa in a nursing home. Those with Down Syndrome deserve to live their lives with the same freedom the rest of us take for granted. A powerful story about a decision that should never happen again. Thank you. I stand with you. They should treat all as human being despite of their disability. They might not be able to talk but they have a mind & heart to consider. Thank you so much for the update!! I’m so excited for Teresa — what a wonderful life she is living! And that’s just the way it should be!! What joy! An inspiration for all! I stand with you to protect everyone’s most cherished human right. The right to celebrate one’s life and to live one’s life to it’s fullest potential. Your dedication empowers others to do the same. Everyone should take the time to sign your petition.